In an inspired move, Swiss luxe alpine wear brand and pocket knife experts Victorinox have hired Brit designer Christopher Raeburn to design a capsule collection for Autumn Winter 2011. Consisting of only eight pieces - one of which is Raeburn's own take on the famous Swiss army knife - the young London creative has managed to merge his forward thinking design aesthetic with the heritage and tradition of the 127 year old brand. 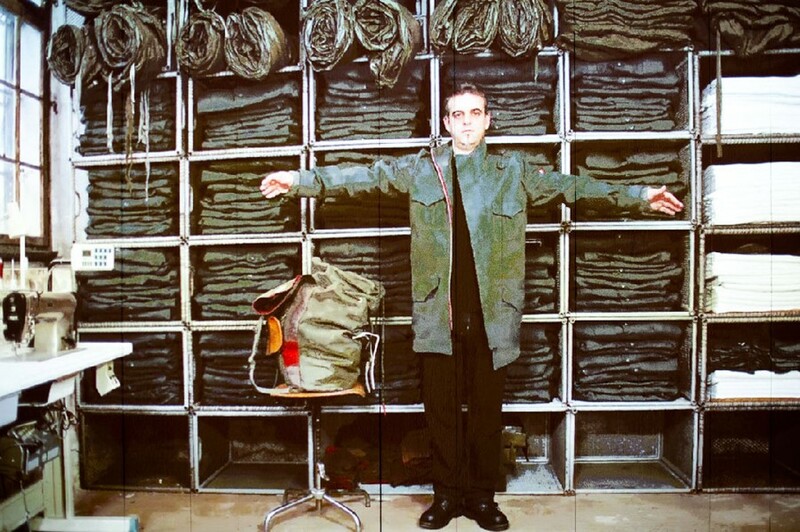 'Remade in Switzerland' is the result of Raeburn travelling to Victorinox's home country to go through an extensive number of army surplus stores in Ibach, the birthplace of Victorinox founder Karl Elsener. Not only did Raeburn source the fabrics for his collection there, but he also managed to find the original house in which Elsener started the brand, and it was there that Raeburn chose to establish his Swiss LAB to produce the 100 pieces of each style by hand. Using existing shapes and vintage fabrics, it was up to Raeburn to bring together his sophisticated design details with the over a century long manufacturing expertise of the Victorinox staff, some of who featured as models in Raeburn's installation during New York Fashion Week. Cleverly bringing together fashion with music, film and photography, the presentation had something for everyone. The stop motion films that had been made for each item in the collection were especially impressive, and the music was put together using only "sounds generated from actual recordings of garments and equipment" during the manufacturing process. Christopher Raeburn: A brand consultant for Victorinox suggested I'd work with them. Lots of brands have asked me to collaborate but none of them resonated with me in the way that Victorinox did. It evoked childhood memories of being given a knife by my two older brothers. I've collected the knifes throughout the years and we use them in the studio. DD: Why did you use Victorinox staff as models? Christopher Raeburn: People are proud and happy to work for Victorinox, and these guys embody the brand. They just had the right character. We didn't want to use archetypical catalogue models, I liked the lo-fi way of presenting the collection. DD: Why did you feel it was so important to mix the clothes with music, film and photo in the presentation? Christopher Raeburn: I really like this holistic design concept, it's an all-encompassing way of looking at it, and we created a brand within a brand. I also think this sort of presentation helps elevate the product, it added value. Today, many young designers fail with their presentation... the product might be good but they don't have it all covered! DD: What were your first impressions of the brand, were you aware of it before the collaboration? Christopher Raeburn: I'd been to the Bond Street store and always appreciated the level of quality, and there's elements of innovation, but design-wise it presented an opportunity for me to bring in my own aesthetic to give it a new dimension and a European thought process since the clothes are designed in New York. DD: Why do you think Victorinox approached you? Christopher Raeburn: I do what they do but on a small scale; the quality, trying to establish a brand, a sustainable approach to fashion. I'm hoping that they saw in me and my brand a label with longevity, since they have been around for ages themselves. DD: What happened after you said yes to work with Victorinox, what was the next step? DD: There's a strong visual print in the collection, the nails - how did that come about? Christopher Raeburn: It's the symbol for the whole collection. They'll come in box of 100 nails and originally they were used to stamp in horse shoes. It's an elegant - yet painful looking nail - with the Swiss flag marked in. I like them, they're simple and efficient. But Victorinox have also melted the nails and used the metal to create our pocket knifes. Christopher Raeburn: Yes, the parka is actually made of the sleeping bag's outer shell, a slightly harder and rougher fabric. Even the zips are re-used and sourced in Switzerland. Christopher Raeburn: Yeah, it's a Captain's Coat, made from original grey coats and Swiss field jackets. As we deconstruct the pieces, we look at how we most efficiently can put it together again through re-paneling it and building around zips and pockets. Christopher Raeburn: Yeah, it was important for both me and Victorinox to gain trust and make sure it got off to a good start. DD: Next question is obvious then - is this a continuous project? Christopher Raeburn: We're really keen on continuing the project in one way or another... the collection might be developed in another way but I definitely think the enthusiasm is there from both sides.